The Wolf Vigil T Shirt features four of the Wolves who have lived at the Preserve, Waya, Niko Akni, Nita and Ohoyo. They are up on their stone den guarding. Wolves stay every vigilant so that no danger comes to the pack. This Wolf t shirt, designed and printed right here at the Preserve is made of 6oz weight 100% cotton preshrunk jersey knit. They are unisex sized. Refer to our size chart for a good fit. Machine wash inside out in cool water on the gentle cycle, tumble dry low to preserve the rich colors of the design. 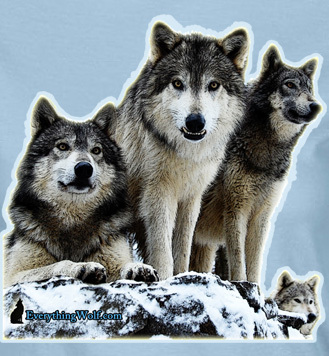 We love the Wolves and the color on this t shirt.